THE DOROKSH RUG - Represents an intentional revival of the region’s ancient carpet-making tradition. The relative peace established in late 19th century Iran set the stage for a cultural revival that would eventually come to encompass all the region’s traditional arts. Renewed market interest, coupled with growing resources, allowed forms ranging from architecture, to portraiture, to calligraphy, to rug-making all to thrive. It was a renaissance in the truest sense of the word: following centuries of war and consequent migration of populations, artists reclaimed their central role in Iranian culture. Not only did they create a new generation of art; they drew on ancient models for source and inspiration. 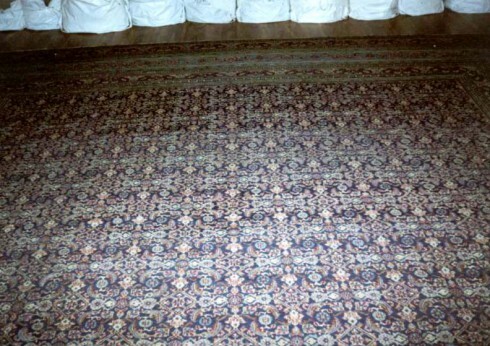 It is in this context that the weavers of northeastern Iran began production of what we know today as the Doroksh carpet. 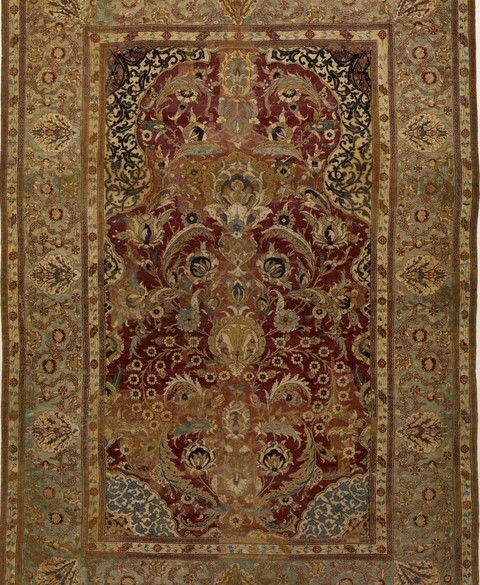 Named for the Doroksh hills in historic Khorasan province, the rugs represented an intentional revival of the region’s ancient carpet-making tradition. Drawing on traditional design, weavers created high-quality, yet priced-for-(high-end) market 19th century takes on their 16th century forebears. From the beginning, the Doroksh rugs, part of both a cultural and economic revival, were intended for sale to the great capitals of the region. As such, they were constructed of the highest quality materials (wool, and later cotton), on large scales, and with intricately detailed traditional patterns. In design, the Doroksh rugs are perhaps most recognisable for their remarkably close hand weave. Using the asymmetric (or “persian”) knot to achieve extremely high knot density, the weavers of 19th century Doroksh were able to create the finely detailed patterns for which their rugs are known. Typically, these patterns will consist of a large central medallion, usually on a plain cream or red colored field, surrounded by a multiplicity of repeating borders. These borders drew on standard motifs of the ancient Khorasan tradition: the arborescent, for example, and the very common boteh (a droplet-shaped motif). Still, for all their adherence to tradition, the Khorasan rug remains a diverse form. 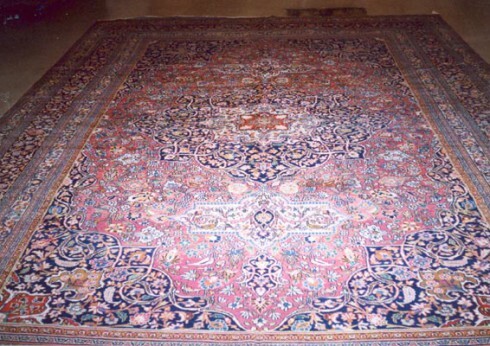 Many of the carpets, for instance, feature compelling animal accents, most typically birds. The 19th century Doroksh rug ushered in a renaissance of textile-making in an area long famous for its woven art. Khorasan (roughly translated as “where the sun arrives”) had been a cultural center of the ancient Persian Empire, home to many early poets, writers, scientists, artists, and craftsmen. Though rug-making in the region stretches back to the 8th century, the Doroksh rugs draw most directly on Khorasan’s later Persian masterpieces—elegant, palatial-sized rugs that are today some of the most prized carpets in the world—as their model. Thus the Dorhksh rugs of Khorasan can trace their roots to the 16th century, when carpet weaving in the area fully evolved from nomadic craft into specialized industry. 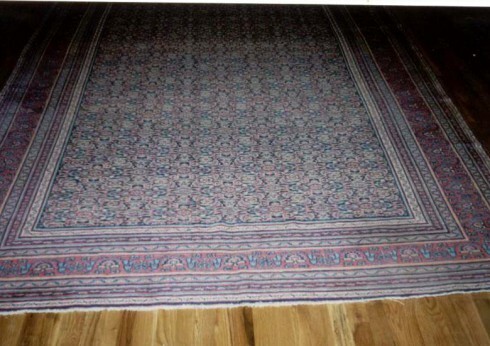 The Doroksh carpet was incredibly successful in the market. By the end of World War I, the unassuming hills of northeastern Iran were known internationally for producing relatively affordable, extremely high-quality hand-made carpets. The rugs are still made there today, and still by hand in the hills of Doroksh. Their repeat patterns and traditionally intricate, repeated motifs have made them favorites of interior designers. In fact, Doroksh carpets are often referred to as “the decorator’s carpet”, as their large size and versatility of subtle color make them ideal centerpieces in modern space.